The Via All Weather Wicker Collection dining set is the perfect addition for those people who entertain often or have regular family gatherings. 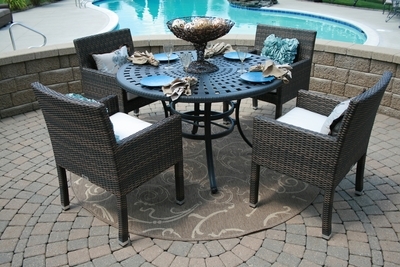 It accomodates 4 people easily, also giving your outdoor area an upscale look for years to come. It is shown in the Viro wicker color Prussian Dark Bronze and comes with 3" thick Sunbrella fabric Canvas Canvas cushions with Sunbrella fabric Canvas Cocoa welt. 4 Armed Dining Chairs: 23.5" x 25.5" x 33.5"